For whatever reason, there are some who will tell you that the idea of the Trinity is not biblical. Consider that the Trinity is taught from the very beginning of the Bible. Right from the beginning we have God, His Spirit and His Word. After all, what do you suppose God spoke? 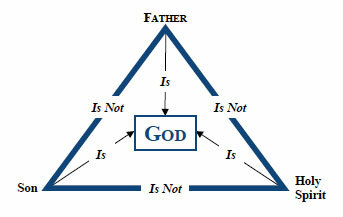 The idea of a triune God is not something we can fully understand. That in no way should cast doubt on the reality of the Trinity. While I agree with most of what you post on here, this is one topic that I do disagree. I’m only going to give a few examples from my notes on this, but if you would like me to add the rest of my notes, please get back to me via email if you have the time. First example is that in the New Testament letters, almost every introduction begins by saying like this: “Grace and peace to you from God our Father and from the Lord Jesus Christ.” (Romans 1:7). John even clearly says, “We proclaim to you what we have seen and heard, so that you also may have fellowship with us. And our fellowship is with the Father and with his Son, Jesus Christ.” (1 John 1:3). If the Holy Spirit is a person, as you claim, why is “he” not listed among those whom we have fellowship with and why doesn’t the Spirit give grace and peace along with his fellows? Second example comes from Genesis. This comes from Genesis 2:7, “Then the Lord God formed a man from the dust of the ground and breathed into his nostrils the breath of life, and the man became a living being.” If you look at the hebrew words associated with this, it becomes more clear. The word for breath here is neshamah which is either translated as wind, breath, or spirit, much like the more commonly used word, ruach. So then you have the spirit described as a breath or wind. The second word to look at is nephesh, which is the word that is translated usually as being, person, or soul. So then let’s take a look at man’s components: God formed man out of the dust of the earth(body) and breathed into him the breath(spirit) of life (the spirit is life [John 6:63]) and the man became a living being(or living soul). So then the true definition of a person, or soul, is one who has a body and spirit and you, a soul, are made of body and spirit. And since we are made in God’s image, God has a body and spirit. So then if a person is a combination of body and spirit, does the Spirit have a spirit? This is also why James says that faith is dead without works just as a body without spirit is dead. This then means that when the body and spirit are separated, the soul ceases to exist temporarily until the resurrection when God returns the spirit (either his for the elect, or the originals for the general resurrection) to all people. Lastly, I’d like to offer Matthew 1:20 and Luke 1:35 as a problem. If we look at these verses, it says that it is the Spirit that conceives Jesus. Now then, this begs the question, who is the actual father of Jesus? Is the Father the Father or is the Spirit the Father? If we look again at Luke 1:35, we begin to realize that the question is absurd and that the Father is indeed the father of Jesus because the Spirit is the power of the Most High. And like I said, if you’d like to talk about this topic further, I’d love to hear your thoughts on this, as I’m open to any discussion. I’m a truth seeker at heart and if I can’t take healthy criticism, I’m not very good at seeking it. I admire your work and your studies so please keep up the good work brother.